The rod seals of Freudenberg Sealing Technologies persuade with their durability and high efficiency. They are primarily used in pneumatic and hydraulic cylinders. 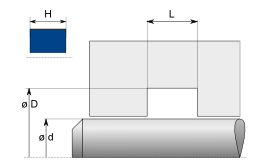 Their task is to seal the retracting and extending cylinder rod , thereby preventing the pressurised operating medium from escaping from the cylinder while protecting the cylinder from impurities. The rod seals are available for every type of cylinder and application.